The 32nd ASEAN Tourism Forum held in Vientiane, Laos, between 17-24 January will further boost travel & tourism to the Greater Mekong Subregion (comprising of Thailand, Laos, Cambodia, Vietnam, Myanmar and Yunnan Province of Southern China), one of the world’s most diverse and exotic destinations. At the same time, it will benefit travel to and through Thailand, especially the North and Northeast provinces which are culturally the richest parts of the kingdom but do not enjoy the same level of tourist popularity as the sun-and-sand beaches of South Thailand. Thailand’s geographical location at the doorstep of the GMS gives it an unbeatable advantage as a bridgehead for travel & tourism flows to the neighbouring countries of Laos, Cambodia and the rapidly opening Myanmar. Evolving transport networks such as the world-class Asian Highway system are making it possible to drive from Singapore to Kunming, and from Yangon to Ho Chi Minh city, all via Thailand. If low-cost airlines have made it possible for “everyone to fly,” boosting road and rail transport through the ASEAN and GMS regions is making it possible for everyone to travel across an integrated, intermodal transport system. Tour operators have immense opportunities to open up new destinations and build unique combinations of fly, drive, air packages regionwide. 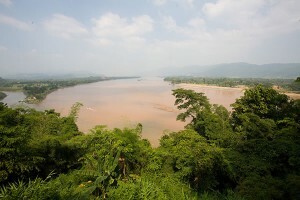 A critical component of this highway network are the three bridges that link Thailand and Laos over the Mekong River. The first Thai-Lao Friendship Bridge over the Mekong linking the Thai province of Nong Khai and Lao PDR capital of Vientiane was opened in 1994. The second Thai-Lao Friendship Bridge linking the Lao province of Savannakhet with northeastern Thailand’s Mukdahan province was opened in 2006. The Third Thai–Lao Friendship Bridge, linking Nakhon Phanom province in Thailand with Thakhek, Khammouane in Laos was opened in November 2011. In April 2013, the Fourth Thai – Lao Friendship Bridge is expected to open. The 480 m long bridge will link the Huayxai district in Laos’ Bokeo province to Chiang Khong in northern Thailand’s Chiang Rai province. The bridge is part of the GMS north-south economic corridor project, linking Chiang Rai province to Kunming, via Highway Number 3 in Laos. Positive results are emerging from this increased connectivity. One remarkable statistic is that visitors from Laos to Thailand crossed the 900,000-mark in 2012 and most probably will cross the one million mark this year. In addition to border-crossers, thousands of emerging middle-class Laotians are coming down to Bangkok for holiday, shopping and to attend conferences and trade exhibitions. One of the biggest regional developments is the opening up of Myanmar. Thailand will benefit from this, too. Bangkok is the nearest international aviation gateway, and the Myanmar tourism industry has always maintained that if it could get only 1% of Thailand’s tourism arrivals to also visit Myanmar, it would be more than happy. The Thai and Myanmar tourism sectors are working closely together to help this dream materialise. The completion of a vital missing link of the Asian Highway linking Thailand, Myanmar and India will cement this deal. The road will run from Mae Sot in Thailand to the Moreh in the Northeastern Indian state of Manipur via Myanmar. All three countries are helping to build various stages of the road, with India undertaking the task of repair/upgradation of 71 bridges. The entire road is expected to be ready by 2016. Another major project being expedited is the deep-sea port of Dawei in Myanmar, which will also have a direct road link to Thailand. To the east, the conclusion of a single-visa agreement between Thailand and Cambodia will also make it easier to go from Bangkok to the famous UNESCO World Heritage site of Angkor Wat, near the Cambodian town of Siem Reap. Citizens of 35 countries will be eligible to apply for this visa which will allow them to stay up to 60 days in Thailand and 60 days in Cambodia. Tourists will be able to apply for the visa at embassies of either country. The agreement comes under the framework of the Ayeyawady-Chao Phraya-Mekong Economic Cooperation Strategy (ACMECS). By 2015, the ASEAN Economic Community, or AEC, will allow significant regional trade and services liberalisation to take effect. With the exception of Yunnan Province, the GMS countries are also members of ASEAN, which is gearing up to take advantage of the emerging opportunities and prepare for the emerging challenges. There will be plenty of both. As economic opportunities emerge regionwide, two major growth areas will be business travel and the so-called MICE sector (meetings, incentives, conventions, exhibitions). To make it easier for tour operators to take advantage of these opportunities, the Tourism Authority of Thailand (TAT) has designed a suggested itinerary of 4 days 3 nights cultural tour programs connecting Bangkok-Buriram-Surin-Siem Reap-Phnom Penh. The TAT also has launched a bilingual Thai-English website http://th.aectourismthai.com to provide updates of ASEAN developments of relevance to travel & tourism. Travel industry executives wishing to take advantage of the emerging opportunities should attend the annual trade show, the ‘Thailand Travel Mart Plus Amazing Gateway to the Greater Mekong Subregion’ (TTM+), to be held 5-7 June 2013 at the Impact Muang Thong Thani Convention & Exhibition Centre in Bangkok. Further details: http://www.thailandtravelmartplus.com/. Another organisation that can help is the Pacific Asia Travel Association, which is based in Bangkok. This year, PATA will be holding its annual conference and associated events in Bangkok between April 26-30, 2013. Further details are being finalised at the time of writing.